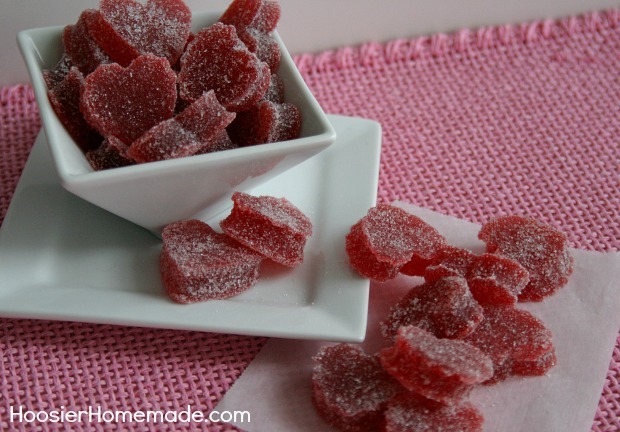 Perfect for Valentine’s Day treats, these Homemade Gumdrops are super easy, soft and taste great! 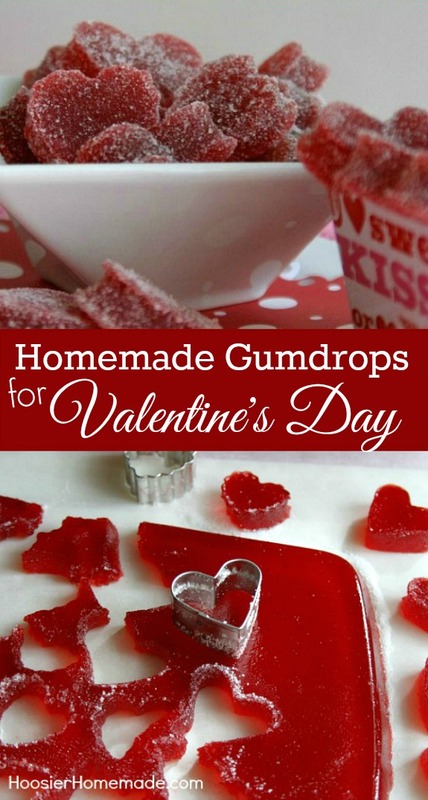 Wouldn’t your Valentine love getting some of these Homemade Gumdrops? They also make great gifts for neighbors, friends, co-workers, etc. The gumdrops can also be made in a variety of colors, like the Gumdrops Recipe that I made during the Christmas holiday. The beauty of this gumdrops recipe is that you can change the flavor simply by changing the flavor of the Jello. To make them special for Valentine’s Day treats, I cut them into heart shapes using the mini cookie cutter from the Romance Set, the same ones I used for the Valentine’s Cupcakes with the Hearts in the center. After the Gumdrops set up in the refrigerator, loosen sides from pan with a spatula and turn them onto a cutting board. I found it easiest to cut them this way. Use parchment paper in the pan, lightly spray it with cooking spray. Be sure to leave a couple inches of parchment paper laying over the edge so you can lift them from the pan easily. These will taste different than store bought, the ingredients are different. However, they are soft and delicious, in my opinion. Won’t these be perfect for teacher gifts? Or even as classroom treats? I found these little treat boxes in the dollar section at Target, there were maybe 4 or 5 in a package. 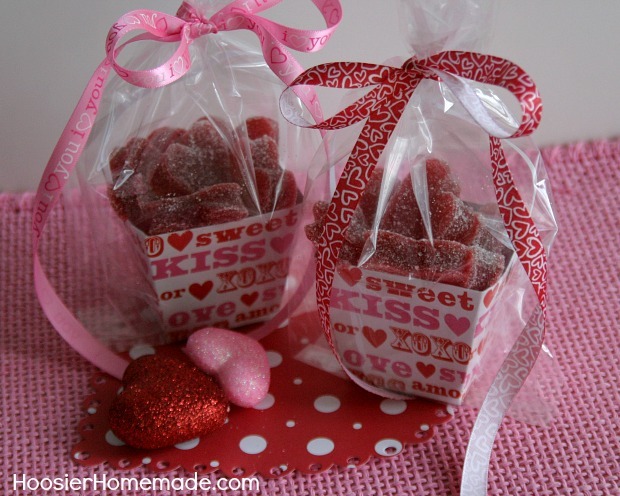 Another fun classroom treat are the Valentine’s Day Treat Bags that I shared, did you see them? They go together in about 15 minutes and there is a FREE Printable too! I always loved helping out in the classroom for parties. 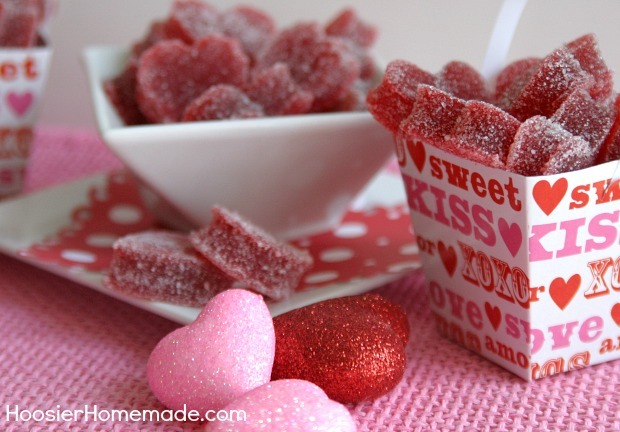 Are you sending in Valentine’s Day treats with your kiddos? Or maybe the office? 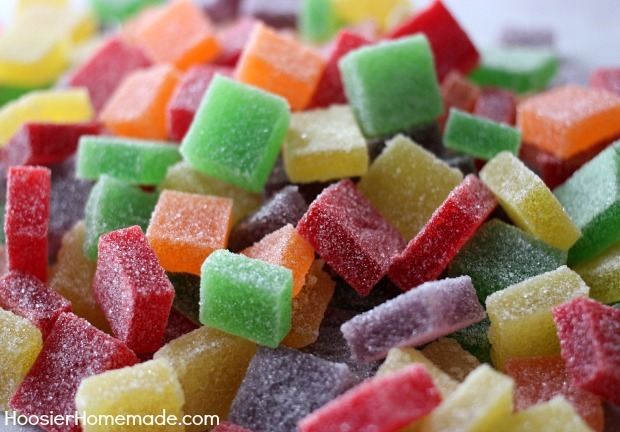 You may also like the different flavors in this Gumdrops Recipe! Soft, chewy and delicious. These Gumdrops can be made in any flavor. Gum drops were my mom’s favorite. These make me think of her. She would have loved a carton full of these, of course so would I. The look delish and so festive! I tried this recipe for Christmas and the gumdrops were sooooo good, planning to make them again for Valentine’s Day for my grandson’s kindergarten class. 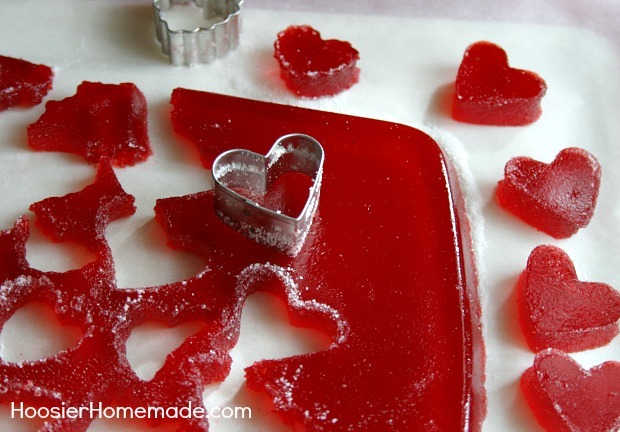 I would love to make these for Valentine’s but The gelatin I use comes in a container. Could you tell me how much gelatin would equal the two envelopes required? Thanks. Hi Angie, each envelope has 2 teaspoons so you would need 4 teaspoons in this recipe. Hi Christine, no water is necessary, the applesauce and lemon juice create the liquid part, the mixture is very thick. going to have to make some. it seems so easy. Loving what you have posted! YUM! These look so good! And homemade is always better. I love that it’s not super complicated too. I will have to try this very soon 🙂 Thanks! OMG these LOOK AMAZING!!!!!!! I LOVE gumdrops!!! Where do you live? can I come pick some up? Totally making these… So stinkin’ cute! !